I was recently reading an interview with Steve Reich in an essay anthology called Sound Unbound, and in it he talks at some point about the sin of Adam in eating the forbidden fruit. He mentions an interesting angle on the primal sin myth, which comes from the Zohar, the central book of Jewish mysticism. According to the Zohar (not to be confused with the Zohan), the original sin was really one of timing. If Adam and Eve had been able to wait until the Sabbath, enjoyment of the fruit would have been permitted. But Adam couldn’t control himself and had to take a bite a couple hours before the start of the holy day. Reich mentions this version in relation to the steady march of technological advancement, over which us humans don’t really seem to exercise much control. That is to say, we couldn’t just collectively decide to take a few years off from developing faster and faster processing chips. Now, when I read this, I suddenly realized, as an inadvertent brand guy, that this must be the idea at the core of Apple‘s brand name and logo! (Whether Apple’s marketing team knows it or not.) Now, I’ve read a few lazy descriptions of the Apple naming process that claim “Apple” was essentially developed a “fun” alternative to what was on the market at the time. Which may be true. 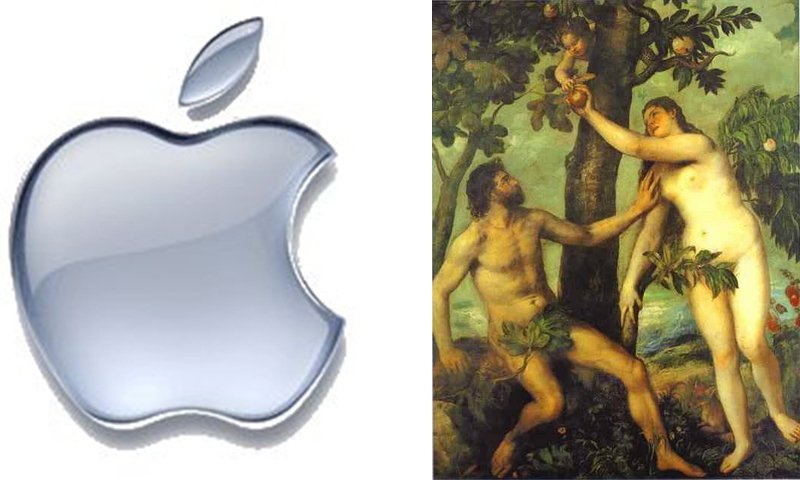 But I prefer the idea of Apple products as the forbidden fruit, that tempting morsel that Adam just couldn’t keep himself from sampling before the designated time, knowing full well he was about to damn mankind for all eternity. After all, someone’s taken a bite out of the apple in the logo.